I feel like in this day and age that playing professional baseball with diabetes shouldn’t be a big deal, and certainly not one that would require someone to keep it a secret from everyone around them. If you’re a Chicago native or a Cubs fan, you probably know from where my curiosity comes. 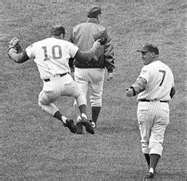 We lost a hero this past week, Ron Santo, former 3rd baseman and current radio announcer for the Chicago Cubs baseball team.